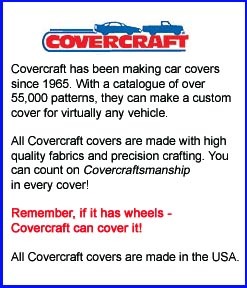 POLYCOTTON car covers by Covercraft are available in over 400 custom patterns for car covers, truck covers and SUV covers. Good basic protection for garage-kept vehicles. Durable, woven polycotton blend offers good basic vehicle protection. Polyester is sun and water resistant, while cotton gives a soft touch to the vehicle's finish. Primarily for garage-kept vehicles, the polycotton cover is a lightweight, easy to handle option. Drill Weave Fabric - Resists tears and punctures. Breathable - Allows evaporation of moisture and reduces heat build-up under the cover. The Polycotton cover is a good indoor cover or occasional outdoor cover. It is not as weather resistant as WeatherShield or BLOCK-IT fabrics, but it does provide basic dust and water protection. The Polycotton is a lightweight cover, well suited for everyday drivers. The Polycotton cover is available in silver gray.